Welcome to another CASEing the Catty Blog Hop. Let me start by sharing a story with you. Friday morning, 1 and 1/2 hours before my card class was due to start, Marvi found a snake in the backyard. The Snake Catcher was here within the hour and he captured it and re-located it. Luckily it was only a harmless tree snake, with a full belly, but I wasn’t taking any chances. This week our inspiration is to CASE from the Sale-a-bration Catalogue. You may have arrived here from Rebecca’s gorgeous creation, thanks for continuing on with me. Make sure you visit all the Design Team’s Blogs by clicking on the “next” button at the bottom of each post. I started at the back of the Catalogue this time and quickly chose the lovely Lily card at the top of page 18. I’ve used some striped In Colour Pineapple Punch DSP over a Thick Whisper White card base. Then used the Layering Circles Framelits to die cut the circle. I stamped the stems of the Lilies in Old Olive ink. I stamped the Lasting Lilies in Grapefruit Grove and some extra leaves then fussy cut them. I popped them all up on dimensionals. 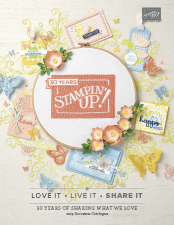 The sentiment is also from the Lasting Lily stamp set and has been embossed with White Embossing Powder. I’ve added some Delightful Daffodil Organdy Ribbon behind the sentiment. Marvi loves to help in the craft room while I’m creating but he doesn’t look too pleased with this weeks card. Next up tonight is Kelly’s beautiful project. Just click on the “Next” button to hop right over. We’d love for you to join us in this challenge. Click below and send us a request to join then just upload your creation to the wall. Eeek a snake!! I had one in my front yard not long ago. I love your card, even though Marvi does not look impressed!! My only garden visitor this week was a blue tongue lizard, and we both got a fright on spying each other! You have made a very beautiful card with the lillies, I must try inking it up soon. Eek! Maybe Marvi wasn’t happy because you took away a potential play mate!! I would have got rid of the snake too! Your card is really lovely, a fabulous CASE of the original. 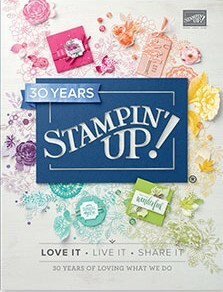 I just love those lilly stamps, so pretty and elegant. Great CASE. Just gorgeous – perfect colour combo! Lovely card, Peta and great CASE. This would be a great layout for other floral sprays too. Gorgeous card Pete, even if Marvi doesn’t think so. Oh lol, Marvi. You shouldn’t look so disappointed with such a lovely card! Such neat fussy cutting, it really gives the card so much more dimension having them sticking out of the circle like that. Great CASE.